Claire Lieberman is an artist who explores the sublime and its relationship to quirkiness through a wide use of materials, from Jell-O to video and black marble. Her solo shows include: THE LAB, NYC; Marcia Wood Gallery, Atlanta; Gebert Contemporary, Scottsdale; PDX, Portland; Seoul Art Center, South Korea; University of Alaska, Anchorage; PDX Gallery, Portland; and Anderson Gallery, Virginia Commonwealth University. Group shows at: Chelsea Art Museum, International Print Center, NYC; Galerie ACC, Weimar, Germany. Press: Sculpture magazine, The New York Times, Art on Paper, and ARTnews. Brett Wallace: How did you first get involved in art? Claire Lieberman: An excursion to pour plaster casts on the beach of Lake Michigan when I was in an art class at 4 or 5 comes to mind. Fresh air, warm sand, and the ambient sound of waves set an immersive stage for creativity. Ever since, I’ve wanted to put my whole body into making. The Boston Museum School, where I studied, was a very conceptual program. So I’ve always paired two urges by infusing the intimacy of process with corroboratory ideation. BW: Could you talk about what inspired your latest body of work UDBO Playground (Unidentified Dangerous Beautiful Objects)? Are you interested in the sublime as a way to describe nature? CL: I am interested in the sublime, but paired with quirkiness—how tactile engagement and lush visuality bump into historical association. By that I mean sculptural tradition and the way stone has been used to render greatness. This show fools around with exchanges of play and power by looking at how violence in contemporary culture can be rendered with associative imagery of attraction and repulsion. I chose a game-like configuration to explore the relationship between playing and sublimated aggression. As you move in and about the individual sculptures, there is a kinetic sense, like that in a video game. The sculptures in black marble are a combination of exquisite and brash— a re-formation of classical sculpture through fleshier images of danger. Such a notion of the sublime expands the concept of beauty to include dissonance. 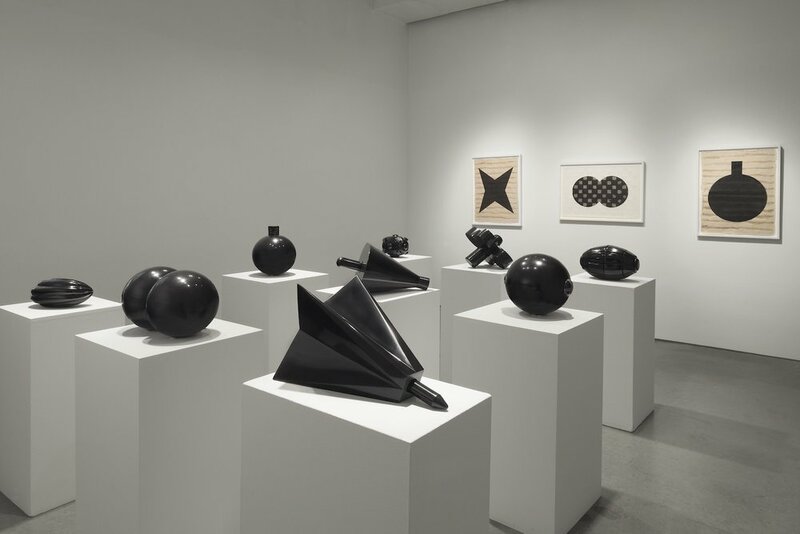 BW: In the recent show, there are glass guns and fruit modeled out of polished black marble. What are the conceptual ideas underpinning this work? Contradiction seems to be consistent in the object / material relationship in this work - is that of interest to you? How important is symbolism in your work? CL: I began this body of work after the last election, which was disturbing because the campaign had portended impending chaos. This ensemble of pieces is partly a reaction to that sense, and they are meant to be direct, even harsh—if also reflective, smooth, refined. I am probing the aesthetics of violence as a way of understanding conflict—an expansive topic. The glass guns in this show are part of a series beginning with literal representations of handguns that transform into space-age toy guns that are increasingly phantasmagoric. To me, a toy gun is an icon that embodies the conflict between reality and fantasy in the mind of a child, and in American culture in general. The idea of fruit that you responded to comes out of pondering these objects as stand-ins for the body. A melon as a symbol is moist, sweet, fertile. The form is in the vicinity of a grenade—but so much the opposite. It’s true that juxtaposition is an important underlying thread: one “grenade” is inscribed with flowers. In my dreams, this is a peace and love show! BW: Material use and sensitivity how materials transform objects seems to be core to your work. Why did you choose the materials you did here? With the black marble pieces, the stone is heavy, immobile, a marked contrast with disposable playthings they represent. A grenade in black marble rendered as a fleshy form is not only dense, shiny, and dark, but luscious and precious as well. The shape shifts from a literal representation of a grenade to a sensual, disarming form. The glass gun series is called Ice Guns, and grew out of an earlier video that showed toy guns cast in ice that gradually melting on hot pavement and recollections of space guns and water pistols. Using glass is a way to capture that fluidity—I’ve said before, I’d like to cast the guns in ice, let it melt away, and cast the melting. That’s the feeling I’m trying to capture. These guns are transparent, fragile, even delicate. As with the fleshy grenades, the fragility of the guns operates reflexively: the object and the material are intertwined, each emphasizing but also destabilizing the other. BW: Could you talk about your previous use of materials such as the works with Jell-0 and with the Brown Bear? CL: Flashes of humor and sensuality come together when stone is situated next to what I would call its alter-ego, Jell-O. In my multimedia projects, lucent gelatin shapes are duplicated from carved marble elements. It’s no surprise that commercial “ballistic gelatin” is used to measure the impact of bullets on the body. The Jell-O components—flimsy, sticky, silly—are usually disrupted either physically (for example, by a foot stepping on them) or by time, as they wither and shrink. The use of Jell-O also evokes the interior of the physical self. As the Jell-O is traversed or as it dissolves, it suggests the bodily experience of violence. In one piece, the image of Jell-O shaped into water balloons refers to collective memories of early childhood, where aggression is repressed but still experienced in good-natured fun. Jell-O also tickles the argument between art and life, as playing with food is an eternal no. By encountering art, nature, and childhood memories through real, yet chimerical and fantastical objects, the viewer forms connections between their notions of nurture and eventual attitudes toward nature. As for Brown Bear, there is a softness in children’s playthings. Stuffed animals are stand-ins for our corporeal state. They are meant to be held and hugged. In a video sequence from one of my earlier projects, imagined furry friends set out on a quest. They have misguided notions of power and control and are ready, even hoping, for trouble. But what they find is a surreal frenzy of unimagined and ubiquitous collapse. BW: Who are some of the artists (or people, things, objects, experiences) that have influenced your practice? CL: I’m attracted to films with gorgeous, persistent stillness that is punctuated by unexpected moments of intensity. For example, an early Herzog film, Aguirre, The Wrath of God, which is also a useful cautionary tale. I remember Wim Wenders’s three-hour, black and white Kings of the Road more for the endless stretches of highway than for its set of smaller narratives. Mid-century space guns were, of course, the starting point for the toy guns. They ricochet between nostalgia (for a concocted version of times gone by) and observations of actual weaponry which in the past was highly decorated. Perhaps adding a splash of friskiness. I implicate myself – I played with water pistols as a kid too. 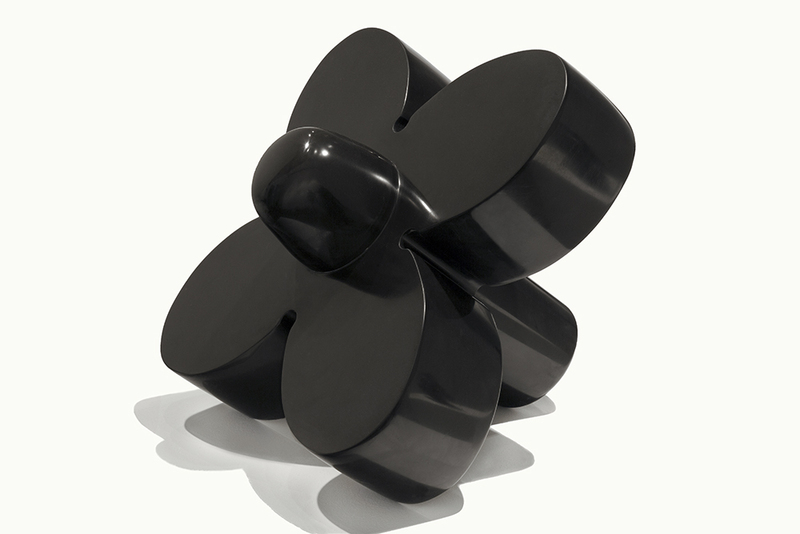 Claire Lieberman, GRENADE WITH FLOWERS, black marble, 2017. The artist's current show at Massey Lyuben gallery in New York runs until November 11th. The press release is here.